Over the past ten years, Hangzhou, China, has tripled in size and gained over one million in population. 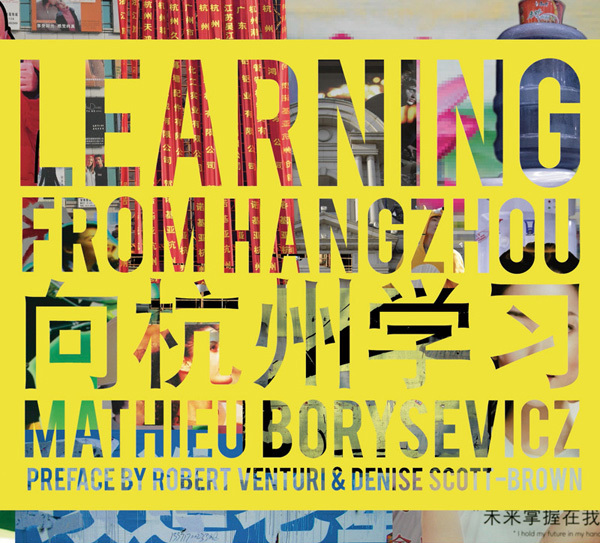 With scores of photographs, an introduction by Robert Venturi and Denise Scott-Brown, and incisive texts, Learning from Hangzhou presents a historical city under the physically and culturally transformative influence of China's economic expansion. From 2003 to 2008, over 3000 images were recorded and divided into patterns of reoccurring visual phenomena. The resulting catalog presents a developing city codified by its own physical utterances. The ubiquity of demolition and construction, vast architectural eclecticism, invasive signage, accoutrements of habitation, and cultural desire all collide head on in a city once renowned for its tranquil beauty. This case study of Hangzhou is indicative of the rapid evolution that is enveloping many Chinese cities; it also provides lessons for an urbanizing world increasingly plagued by a claustrophobic framework of signifiers and frivolous commoditization of public space. Mathieu Aleksandr Borysevicz is an artist, writer, and filmmaker. For fifteen years, he has split his time between New York and China. His work has been shown worldwide at venues such as ICA, London; the Bauhaus Foundation; Mass MoCA; the Bronx Museum; the Doland Museum, Shanghai; the Storefront for Art and Architecture, New York; and the Tribeca Film Festival, among others locations. He was Artforum's Shanghai editor from 2007 to 2010. His writings on contemporary Chinese culture have also appeared in many exhibition catalogs and magazines, including Art in America, ArtAsiaPacific, Art Review, and tema celeste. He has curated and consulted for institutions such as the Asia Society; Aperture; the Jack Tilton Gallery; DDM Warehouse, Shanghai; and Millenaris Park, Budapest. He is currently director of the Shanghai Gallery of Art at Three on the Bund.